This is a review of what the best probiotics for IBS actually are, explained in a way you can understand. Which Probiotics Species Are Best? Which Probiotic Brands Are Best? What About Kijimea and Saccharomyces Boulardii? Should Probiotics Be Taken On A Low FODMAP Diet? The term ‘probiotics’ refers to bacteria that we eat specifically for health benefits. 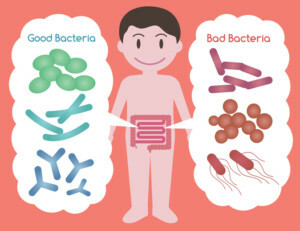 They are capable of altering the balance of bacteria that already exists in our gut (large intestine), known collectively as our gut microbiota. Our gut microbiota is thought to consist of up to 1000 different species of bacteria, which can be further categorised into individual strains. Probiotics are made up of a single or mixed-culture of species and strains in specific doses. It’s widely accepted that their effectiveness depends on the species you consume and what species already exists in your gut. The most common and well-researched are species of Lactobacilli and Bifidobacteria. Notably, IBS patients appear to have lower levels of both species compared to an otherwise healthy person (1, 2). It’s thought the addition of the right types and numbers of bacteria to the gut can improve gut health (and maybe even alter our weight). However, the precise mechanism of action of probiotics is still unknown. 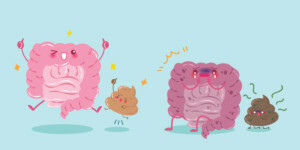 Looking specifically at IBS, the theory is that certain strains can promote an anti-inflammatory response, improve visceral hypersensitivity, gut dysmotility, intestinal permeability (“leaky gut”), and even remedy dysfunction of the gut-brain axis (3, 4, 5, 6, 7). Assuming this is true, we would then expect that probiotics would greatly improve IBS symptoms. Summary: Bacteria that we consume for health benefits are called probiotics. There are many different strains (types) that may help with IBS although the mechanism of action is poorly understood. It’s difficult for IBS researchers to pinpoint just how effective probiotics are. This is due to differences in study design, patient populations, probiotics strains and dosages used of previous clinical trials. Generally speaking, there is emerging evidence that probiotics help to improve overall symptom response and quality of life compared to taking a dummy pill (placebo) over an 8-10 week period. This goes for all type of IBS (IBS-D, IBS-C, and IBS-M) (8, 9, 10). 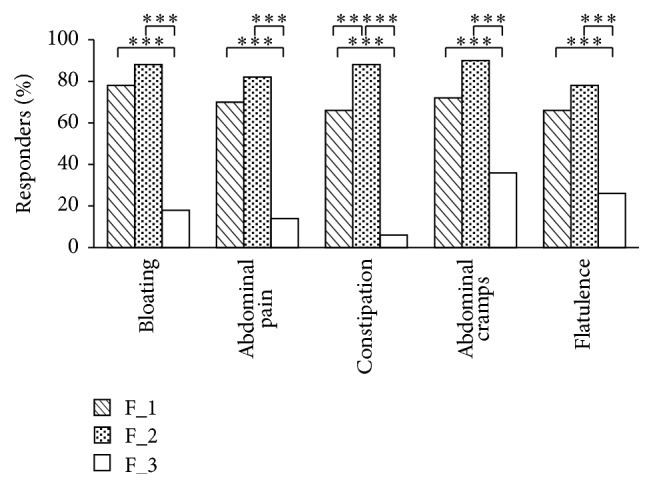 However, they appear less effective for specifically treating abdominal pain, excessive gas and bloating (11). 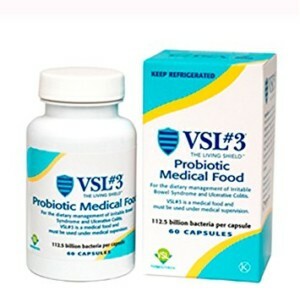 VSL#3: a probiotic mixture of eight strains (more on this below) (15, 16). As you can see in the the table here, the strains Lactobacillus plantarum 299V and Bifidobacterium animalis (also known as Bifidobacterium lactis) were also rated, although not as highly. 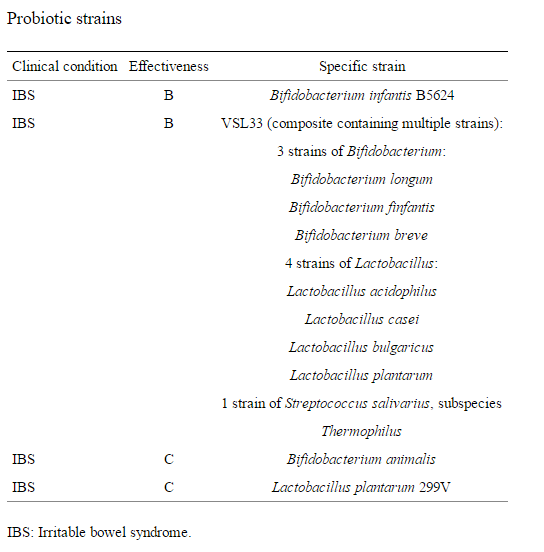 A list of probiotic strains rated for effectiveness in IBS at the 2011 and 2015 Yale University Workshops. Click to enlarge. Note that recommendations are given as A, B or C ratings. None of the probiotic recommendations for IBS are rated A because more studies are needed first. Summary: In 2011 Yale university rated Bifidobacterium infantis and VSL#3 as the best probiotics for IBS. Lactobacillus plantarum and Bifidobacterium animalis (lactis) may also be useful. Given the majority of IBS patients experience diarrhea as their main symptom (IBS-D), the majority of study subjects is no different. For this reason there is much more data on treating diarrhea, and a general lack of recommendations for those struggling with constipation (IBS-C). Fortunately there has been a recent 90-day clinical trial on 122 patients with IBS-C. The researchers wanted to test the effects of two different probiotic mixtures versus a dummy pill (placebo). 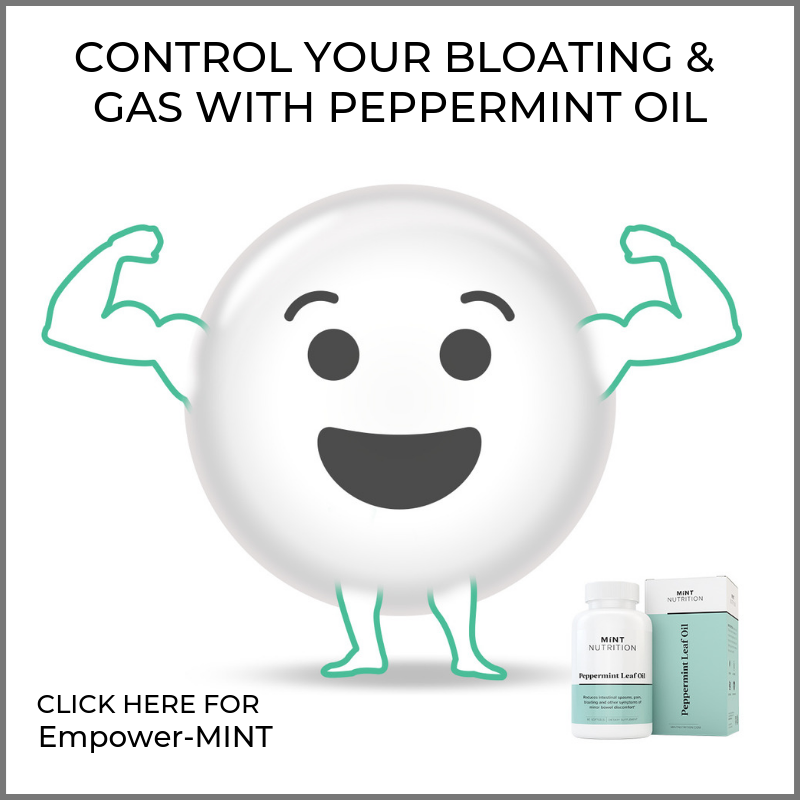 They found that between 66-90% of those taking either probiotic mixture responded very favorably to effects on bloating, abdominal pain and cramping, flatulence and constipation. By contrast, only 6-36% of the placebo group responded well (17). Percentage of responders to IBS-C related symptom during the treatment period (t60, days) with probiotic formulations F_1 and F_2. F_3 was the placebo group. Click to enlarge. Additionally, they found that beneficial effects were maintained 30 days after the last intake of probiotics. At least, after taking the probiotics for 60 days first. From these data it seems that probiotics containing at least a mixture of Lactobacilli species warrant consideration if you are having trouble with constipation. Notably, the second mixture performed best overall and it contained both Lactobacillus plantarum and Bifidobacterium animalis. These were both mentioned in the 2011 and 2015 Yale top list. Summary: A recent clinical trial on IBS patients with constipation found that a probiotic mixture is greatly beneficial in up to 90% of users. I realize that listing the best species is not so practical when it comes to purchasing an actual product. So these are the best probiotics for IBS currently available based on the current evidence and the opinion of gastrointestinal specialists. They are not listed in any particular order, and it’s currently not possible to recommend one over the other. 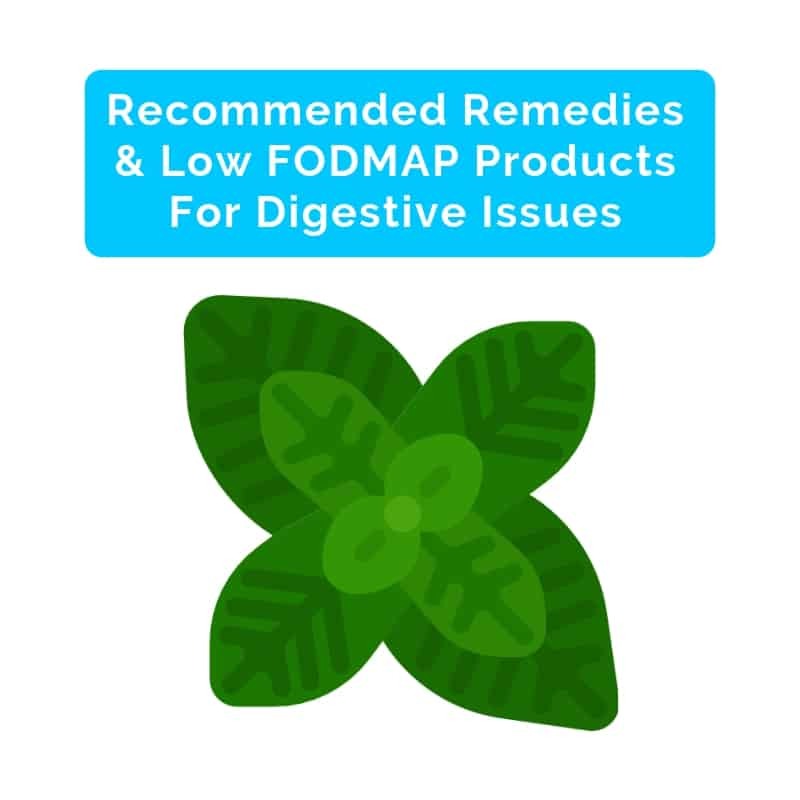 Dosage recommendations are listed on the product and none of them contain inulin (high FODMAP), but always speak to your doctor before trying any new supplement. This is one of the more well-known probiotic labels, highly regarded in the medical community. In Europe it is now called a “poly-biotic” due to new regulations. It’s also known as Vivomixx, at least in Australia and New Zealand. VSL#3 was designed for patients with IBS, ulcerative colitis or an ileal pouch. VSL#3 is well-studied and was used in many clinical trials cited in this article. It has a strong and consistent track record for treating IBS symptoms in adults and children. You can see a full list of studies using VSL#3 here. They also have a children’s variety available. A healthy gut contains a balance of each of these, but it’s likely an IBS gut does not. 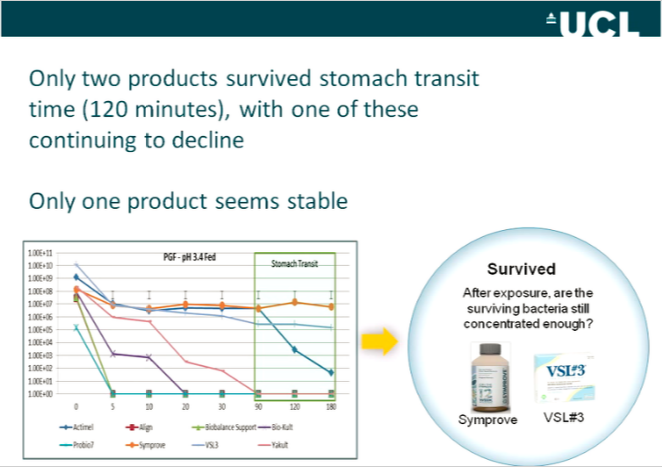 The manufacturers claim it works better than other brands, and they tested Symprove against 7 other probiotic products in a laboratory experiment designed to mimic the environment the probiotic would experience in the body (19). Based on these data it is superior because the bacteria actually survive all the way to the gut, where they can then grow and make a difference. Data from the study that show which products survived best in stomach acid over 180 minutes. Image source. Click to enlarge. Data from the study that show which products contained bacteria that grew and thrived after exposure to stomach acid. Image source. Click to enlarge. For the record, VSL#3 was tested in this study and fared extremely well alongside Symprove. The findings are very interesting, but keep in mind this was done in a laboratory and not actually measured inside a human or animal. There is also one published 12-week clinical trial of Symprove in which 152 IBS patients completed the study. Those taking the probiotic experienced a significantly greater reduction in symptom severity compared with the placebo group. This became very evident after the 4-week mark (20). 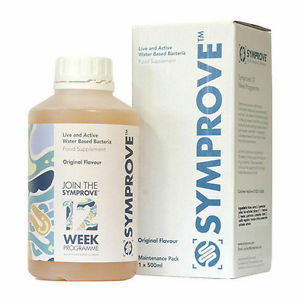 Average change in IBS symptom score over a 12 week period between Symprove (active) and placebo. Four weeks after discontinuing treatment, the benefits largely disappeared. This suggests patients may requires ongoing treatment with Symprove. For the record, Symprove is the most expensive of the three products listed in this article. This product is claimed to be the number 1 gastroenterologist recommended live culture in the US. It’s called Alflorex in the UK and Align in the US and Australia (I’ll just refer to it as Alflorex here). 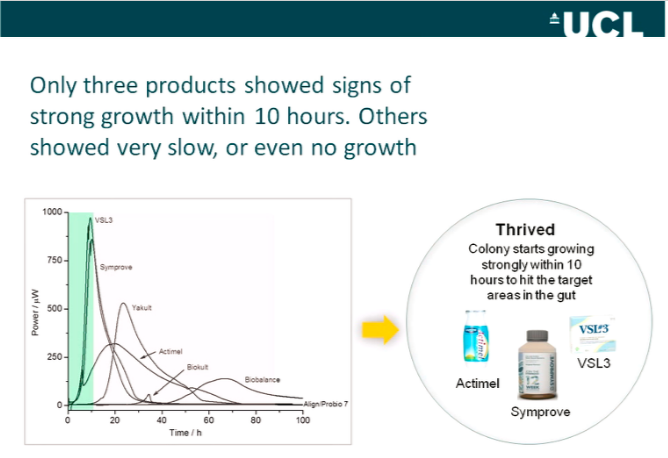 Unlike VSL#3 and Symprove, Alflorex is a single-species probiotic. That is, it only contains Bifidobacterium infantis 35624 and nothing else. This is trademarked as Bifantis and was one of the top rated probiotics in the Yale University workshop mentioned above. Notably it’s also the most affordable of the three products listed. As you’d expect there is a lot of research showing Alflorex has beneficial effects on gut health and bacteria, particularly in IBS patients (21, 22, 23). Additionally, one of the latest probiotic review studies concluded that single species probiotics are most effective for improving overall IBS symptoms (24). On the other hand, a very recent meta-analysis claimed Bifidobacterium infantis 35624 was largely ineffective for treating IBS. However, the authors appear to have mistakenly compared products with different Bifidobacterium species (25). As a result, a formal comment on this paper has recently been submitted that disputes those findings (26). Note that Align was one of the eight products tested in the Symprove study mentioned above. They found it did not survive exposure to stomach acid and as a result did not grow to significant numbers in the gut. This observation is clearly at odds with previous data from clinical trials, as well as the opinions of many researchers and gastrointestinal doctors. It’s likely their findings don’t paint the whole picture. 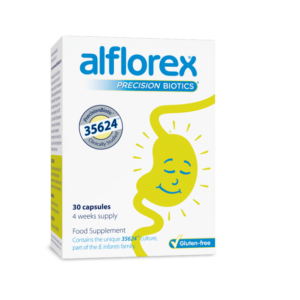 Honestly, I’m not quite sure what to make of it all but Alflorex is certainly worth a try if you have IBS. It’s also available as a children’s drink and children’s straw, and appears safe for infants (27). 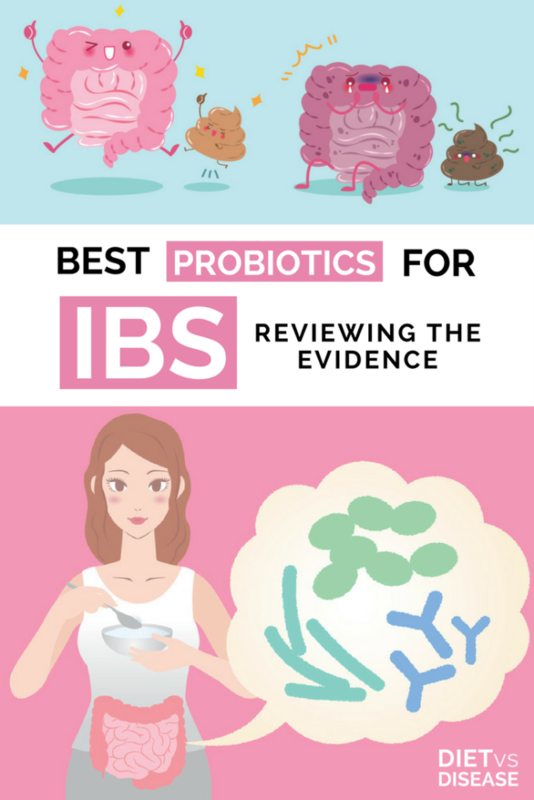 Summary: Based on current evidence and medical professional recommendations, the most effective probiotic supplements for IBS are VSL#3, Symprove and Alflorex/Align (in no particular order). Kijimea is a popular IBS probiotic pill in the US. It contains a strain of bacteria called Bifidobacterium bifidum MIMB75 and is the only product with this strain. There’s been one clinical trial using this strain, which included 122 patients. After 4 weeks, 47% of those taking B. bifidum MIMB75 reported significant improvements in pain, bloating, urgency and digestive disorders (as assessed by questionnaire). Whereas 11% of patients taking the placebo pill (fake pill) reported benefits (28). So Kijimea certainly shows some potential, but the science supporting it is thin. The popularity likely comes from the fact it is easily available on Amazon and has great user reviews. Saccharomyces is a type of non-pathogenic yeast. The two main species used as probiotics are Saccharomyces boulardii and Saccharomyces cerevisiae (commonly known as baker’s yeast). Research indicates that Saccharomyces boulardii is an effective treatment for antibiotic-associated diarrhea and traveller’s diarrhea. However, the evidence for its use in IBS or IBD treatment is still in its infancy and is not recommended over the strains mentioned above (29, 30). I only found one human clinical trial investigating Saccharomyces cerevisiae on IBS patients. In this study 86 patients took Saccharomyces cerevisiae for 8 weeks while the other 93 patients took a placebo (fake) pill. Results showed that 63% of the probiotic group reported an improvement in abdominal pain vs 47% in the placebo group in the last 4 weeks of treatment. Not exactly an overwhelming result (31). There were no other differences between the groups, indicating that Saccharomyces cerevisiae is not very effective. Summary: Kijimea is a popular probiotic supplement that is easily available on Amazon. 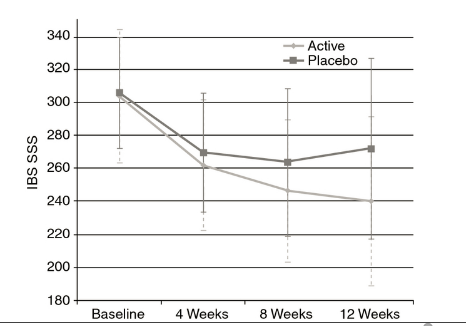 Only one human trial has found it to be (somewhat) effective compared to placebo pills. Saccharomyces boulardii appears effective for treating certain types of diarrhea, but not so much for IBS. Saccharomyces cerevisiae does not seem very useful for IBS. The low FODMAP diet is one of the proven methods for treating IBS. It involves first eliminating most FODMAPs from the diet for a 3-8 week period so that you are virtually symptom-free. Then you begin to systematically reintroduce them in order to identify the culprits, followed by a modified diet long term. For this to work, it’s important that other possible triggers of digestive stress are minimized. That includes caffeine, spicy foods, fatty (fried) foods, alcohol, and fiber supplements among other things. Removing these ensures that if (when) symptoms do occur, you will be able to trace it back to an exact FODMAP group. While probiotics can be highly beneficial, some people experience a worsening of symptoms. Given this risk, it’s typically not recommended to start a new probiotic supplement during any phase of the low FODMAP diet. The exception is if you already use a probiotic supplement (successfully) before starting a low FODMAP diet. In this case you you can continue to do so throughout. Summary: Some people may experience even worse digestive symptoms when starting a new probiotic supplement. This will compromise the results of a low FODMAP diet, so it’s not recommended to do them at the same time. It certainly appears probiotics can help manage IBS, but only particular strains and mixtures. Just keep in mind that they should not be used as a sole therapy. In other words, probiotics are most effective in combination with current conventional treatments such as a medications (if recommended by your doctor), and before or after a low FODMAP diet. Also note that they can be a double-edged sword… what works fantastic for some may only make symptoms worse in others. It likely depends on your existing gut bacteria environment. For this reason you should be willing to experiment with different strains and different brands. Where one type doesn’t help, maybe another will. The most clinically proven and recommended brands among gastrointestinal specialists are VSL#3, Symprove and Alflorex/Align, in no specific order. But as always, speak with your doctor before trying anything new. I’ve good results but a few questions. Should have I regularly take a probiotic each day? For always or just the days I’m not doing well? And since my IBS is the “D” type are there specific probiotics for that type. I was interested in one you suggested but it is not available in Canada. I could order from the web but shipping cost more than the product. I really just want one that fulfills the criteria for IBS D and available here. Thanks Joe, you have been a great help to me and I really appreciate it. Hi Bev. I have tried many probiotics, including Align and find that Florastor is the best for me. I have IBS mixed now, but used to lean towards D. Be sure to take it according to directions every day, regardless of how you are feeling. Unless advised by your doctor, stay on it. The low FODMAP diet also really helped me. I have IBS and has been very hard on me as far as pain,bloating and faint weight I have no control over and very depressing. I tried a few meds that you take for 14 days and neither one helped me. So now they are going to put me on the low fab diet. Any help would be appreciated as this is mentally and physically Takeing over me. Hope you’re feeling a bit better Bev. 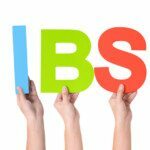 I have IBS (M) after years of IBS (C). The one multi strain probiotic with prebiotics that I’ve found effective & that is available (online at Amazon.ca) here in Canada 🇨🇦 is – SYNTOL AMD by Arthur Andrew Medical. It’s been amazing & I’ve used it for 5 years. Maybe this will give you some relief. This isn’t a bad article, I just wanted to mention that in some parts your confusing “strains” with “species”. A search for “genus species strain probiotics” should be adequate. I was just diagnosed with SIBO. I will be given an antibiotic soon. My dietician said to not take a probiotic until after the antibiotic is finished and I’m feeling better from eating a low FODMAP diet for about 4 – 6 weeks. She said when I’m ready to reintroduce foods into my diet that are high FODMAP then I can start a probiotic, (about 4 -6 weeks after I finish the antibiotic). She also recommended VSL #3. However, I was concerned for it’s so strong so she said to split it in half to start. Also , while I’m on the antibiotic she said to add some high FODMAPS into my diet so the antibiotic has something to do. I thought I had some kind of direction until I read this article and got to the end. It says: While probiotics can be highly beneficial, some people experience a worsening of symptoms. Given this risk, it’s typically not recommended to start a new probiotic supplement during any phase of the low FODMAP diet. The exception is if you already use a probiotic supplement (successfully) before starting a low FODMAP diet. In this case you can continue to do so throughout. I never used a probiotic before. According to this article I should not start a probiotic while on the FODMAP diet? (I actually was on the FODMAP diet since February but kept getting sick on foods that I would reintroduce so I started the diet over again and retested. Again I would get sick. I didn’t know at the time that I had SIBO which was making me sick. So, Should I wait to add a probiotic after I’m done testing all the high FODMAP foods that I want to reintroduce? That could take months but I’m more than willing to wait if that is the best thing to do. I fear having a probiotic making my gut worse or getting a problem with fat malabsorption or something by being on a probiotic at the wrong time or taking too high of dose etc. I never was on a probiotic before I went on the FODMAP diet. So, in light of this article, should I just stay away from probiotics altogether? Should I just eat lactose free yogurt instead until I’m finished reintroducing high FODMAP foods into my diet? Or should I perhaps start with Align since it is less powerful than VSL #3? I’m so confused. I know this is all a gamble but I want to take an educated gamble. I really need help. I have no dietician who understands FODMAP. I have to start the antibiotics soon and I don’t know what to do. Take a probiotic or not. VSL#3 or not? Please help me. I so appreciate it. 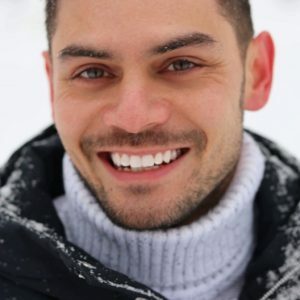 I suffered with IBS-D for 7 years. You should not start a probiotic until after the FODMAP diet. It could make your symptoms better or worse but then it kind of masks the result of the FODMAP diet. The point of the diet is to find out which FODMAP’s you are intolerant to and if you have probiotics it may exaggerate that, or minimise your true sensitivity to those FODMAPs.This is why I recommend doing it afterwards. I drink yakult …i have crohns …it helps emensly .. Your article says “The low FODMAP diet is one of the proven methods for treating IBS. What do I eat if I am to eliminate most FODMAPS? I have read where I should do low FODMAPS, but is this the same as eliminating them completely? Thanks! I have taken many many probiotics. I have IBS mix so What do i take ? I am also taking a PPI and was told by a Dr that I saw while on vacation not take Probiotics while on the PPI since my acid is low and they can be dangerous. I broke up in a rash and he said to stop the Probiotics. I would argue this is one of the best and most reliable articles out there.